My last project of 2015 was a pair of jeans. As most of you know, I mostly loathe modern low-rise pants. I've been on a vintage trouser bender for awhile now, but one of the things I really missed was jeans. When I say jeans I mean the sturdy, triple-stitched, fly-front jeans we all know. These are different than trousers made of denim. I specifically wanted the at-waist, wide-legged, front-zip, many-pocket, belt-looped jeans. There are a few makers of exactly this. Freddies of Pinewood is my favorite. But ever the frugal stitchist, I thought I'd try my hand at making my own jeans before shelling out another $140+ for some that may not fit as I'd like. The benefits of making your own jeans is that you can make adjustments for all your little body quirks. I've been using the belly adjustment from Fast Fit: Easy Pattern Alterations for Every Figure on all of my pants lately, and it's made a *huge* difference in how they fit, how flattering, and how comfortable they are. What stops me from purchasing any more ready-made vintage-style pants is that I have little faith that they will be flattering. So I make my own. 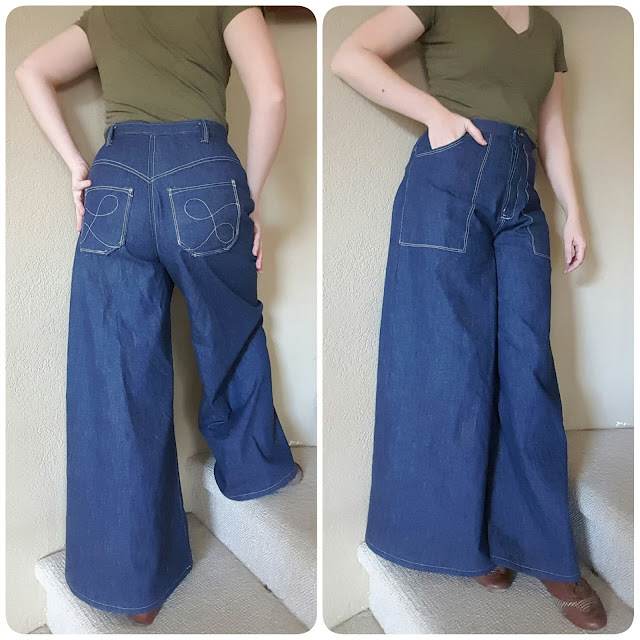 Super wide-legged jeans made at-waist, with center front zip fly, back yoke functional pockets, belt loops, and lots of decorative stitching. Reinforced Stitching - this requires a heavy duty needle and heavy thread. Reinforced stitching includes flat-felling that inseam, top stitching elements, often double, and tacking certain areas securely. Good denim - I go for no stretch, "hard" denim. Once it's washed, that hardness is depleted considerably. I always wash and dry the denim yardage on hot first. For my first pair of jeans, I used a 1970s wide-legged pants pattern, already without darts in front and back. I cut pockets into the front, with this shaped pocket method, and drew the shape of the yoke in back, dividing the two pieces and adding seam allowance. I prepared each leg individually. The back pieces got their yokes and patch pockets, and the front pieces had their pockets applied and top-stitched. Then it was time for the zipper fly. Bookmark this one for later. Srsly. With the fly installed, it was business as usual. I flat-felled the inseams first, then stitched the outseams, overlocking the seam allowance inside. The waistband and belt loops went on, then I washed and dried the jeans again on hot *before hemming. * I did this because I've had jeans shrink up on me even after washing the yardage. I wanted to be doubly sure. Hems went in, pants went on, and I went out to get coffee, feeling like a badass for having sewn my first true jeans. The next day I dashed down to Mill End Fabrics for more denim. Next up? Overalls! Your jeans are super cute!! I need to find, or make a nice pattern for jeans (thanks sway-back). I can't wait to see the overalls, those are gonna be so rad. I have a sway back too, and have that trouble with waistbands gapping. That's an alteration I have yet to make, but I know that book "Fast Fit" has a sway back alteration. Time to go take a look, before making the overalls, which I'm planning to make as pants with a removable top/straps bit. My brother is an archaeologist, and not long ago found a barn filled with vintage jeans and newspapers. He actually wanted to find a way to conserve these, but I'm not sure whether he ever did. The tags alone were kind of fascinating! Wow, what a great find! Very cool! Wow these look great! 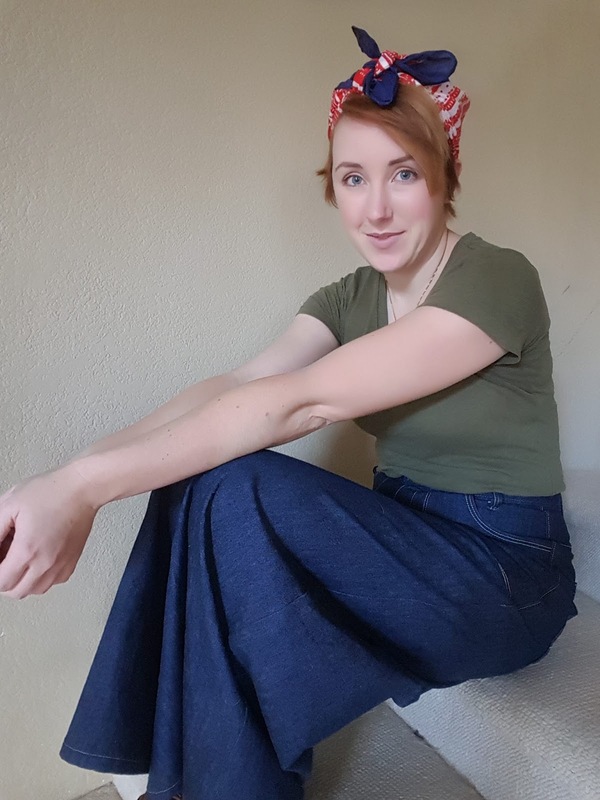 You tackled several of my sewing fears (pants, denim, and zippers) all in one project. Impressive! Those are all things that are pretty scary. I've broken needles on denim before, but there are tricks to getting over the thick bits, and creating good, professional finishes. Conquering the zip fly was a big one for me, but weirdly, even though it has more steps than a usual zipper, I found it a lot easier, with a much better result, than some other zipper methods. Try that video first. Really really worked. Those look great! Like you, I hate the modern low-rise fit and have been making my own trousers for years and years. There is one thing that struck me in your description though: Obviously, proper jeans should not have darts. I always draft my own patterns from my slopers and the way to get rid of the darts on front is shaping the side seams, as you mentioned. On the back, you get rid of the darts by making that back yoke. 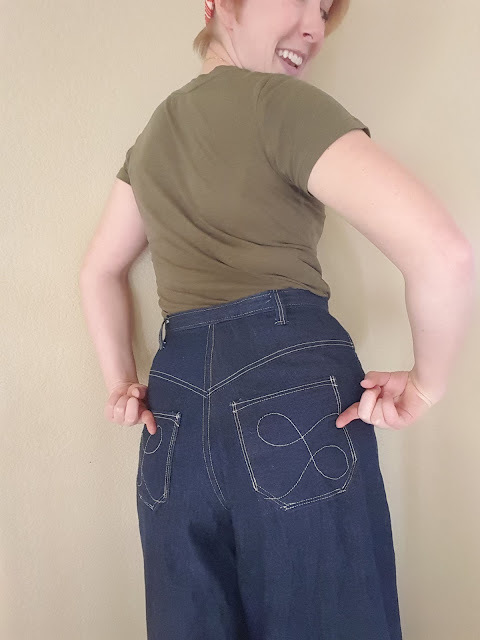 You will also see this in a lot of commercial jeans patterns: The back yoke is more curved than the top of the back leg, creating a curved shape more or less similar (in fact, a bit more subtle) to what you would get with a dart). Back darts on trousers can be fairly deep and shifting all that room to the side seam could cause all kinds of weird fitting issues. Of course, everybody has a different behind so you really need either a personal sloper or a tried-and-tested pattern to know what is right for you and how to change that from trousers to jeans. You bring up a very good point. I didn't encounter weirdness because the pants pattern I was using was both already testing for fit on a previous pair I'd made, and already didn't contain darts, so I knew they fit. I'll keep your caution in mind on the next pattern, which does have darts, and make a toile first to determine the depth of the darts to be converted to the shaped side seam. You can always convert the darts into a yoke. It's hard to go back to my modern jeans (I have two pairs) after wearing any of the vintage at-waist trousers. I just feel like I'm being squeezed and pressed and somewhat violated! No thank you!! These look great! I know I have a bunch of 1970s patterns, now I'm going to dig through them and see if I have any pants patterns. :) I'm totally with you on disliking low rise pants of any kind. I like the 70s straight-legged pants patterns because they have the regular waist and often a higher-than-older-vintage-but-lower-than-modern crotch depth. They're very comfortable and flattering, and don't look '70s at all, if you make them in just wool or tweed or even denim. Oh WOW. Pants are super scary to me, so the fact that you've tackled these and they look STUNNING is amazing! I love the "L" stitching on the pockets!